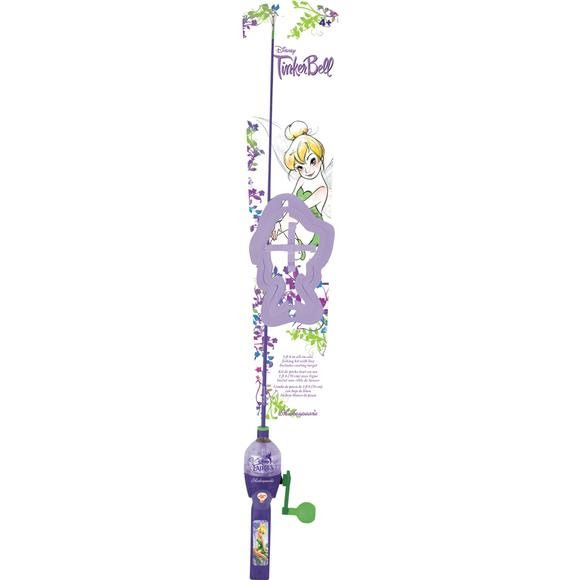 Girls will love Shakespeare's Tinkerbell Light Up Fishing Kit, featuring Disney's TinkerBell graphics and topped off with Light-Up handle with three color LEDs, blue green and red, that flash when casting button is pressed! Girls will love Shakespeare &apos;s Tinkerbell Light Up Fishing Kit, featuring Disney&apos;s TinkerBell graphics and topped off with Light-Up handle with three color LEDs, blue green and red, that flash when casting button is pressed! 2′ 6” all-in-one rod and reel with line. Foam targets and hook for safe casting inside or outside. Can be used as a casting game and also to catch fish!